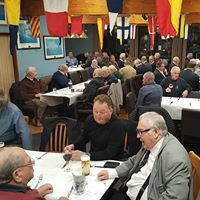 Some 75 members of the historic Hastings Winkle Club gathered last Friday (4th) at the East Hastings Sea Angling Association for their Annual Supper and to celebrate the Club’s 119 years as a Charity which raises money for local good causes. Chairman, Christian Burton explained how the Club had been able to help over 40 such causes during the last year alone. 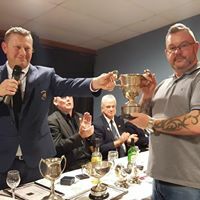 A carvery style meal was enjoyed by all courtesy of the Angling Association’s in-house caterers and the evening also included a cabaret set from top comedian, Adger Brown, an auction and a raffle. Trophies were presented for Best Collection by a Pub (The Royal Albert), Best Collection by a Club (The St. Mary’s Club) and Best Company Contribution which went to Homewood Leisure. 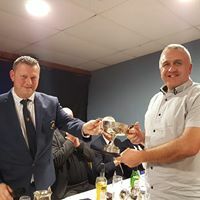 In addition, A Best Individual Effort Award was made to Mike Raxworthy who arranged all the musical content for last June’s Hastings Jazz Festival which raised more than £7,000 for Winkle Club Charities. 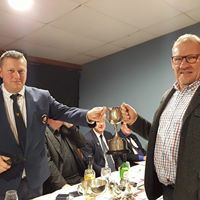 Six new members were inducted during proceedings and a Silver Winkle awarded to Ian Porter and a gold Winkle Pin to Pauline Lindsey for their outstanding contribution to the Club’s work. 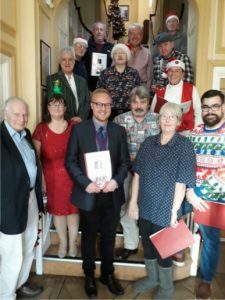 ‘The Winkle Club Choir’ sang to residents of Old Hastings House in the Old Town on Christmas morning, This tradition goes back more than 30 years and this year The Mayor and Deputy Mayor also attended. 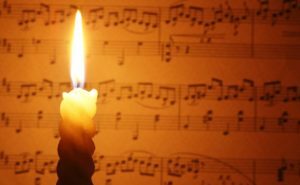 The choir was lead and conducted by Mary Lipscombe of the Hastings Philharmonic. ‘We almost sounded professional and we really enjoy this annual tradition and thankfully so do the residents of Old Hastings House. Richard Stevens, Hastings Winkle Club Vice Chairman. 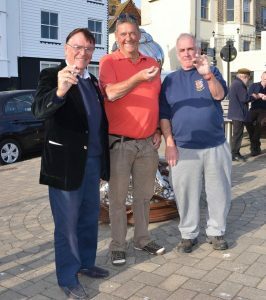 Each year, Old Town Charity, Hastings Winkle Club, is able to select at least two local good causes to receive a rather more substantial grant than is usually the case. One of this year’s fortunate beneficiaries was Hastings & Rother Voluntary Association for the Blind and they chose to use their donation to renovate and revamp one of the bedrooms at their residential home, Healey House, for the blind and visually impaired. 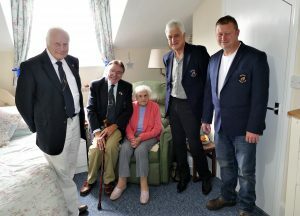 Senior members of the Winkle Club were on hand to unveil a plaque and to meet current occupant, Joan Winchester, 94, who said how pleased she was with the newly decorated room and its furnishings. Chief Executive of Hastings and Rother Voluntary Association for the Blind (HRVAB), Fieona Farrier-Twist said that her organization was both thrilled and delighted at the generosity shown by the Hastings Winkle Club and that Joan’s was the first room to receive such star treatment under their ‘Project Renovation’ scheme at Healey House, Upper Maze Hill. Hastings Winkle Club plays a round for charity. 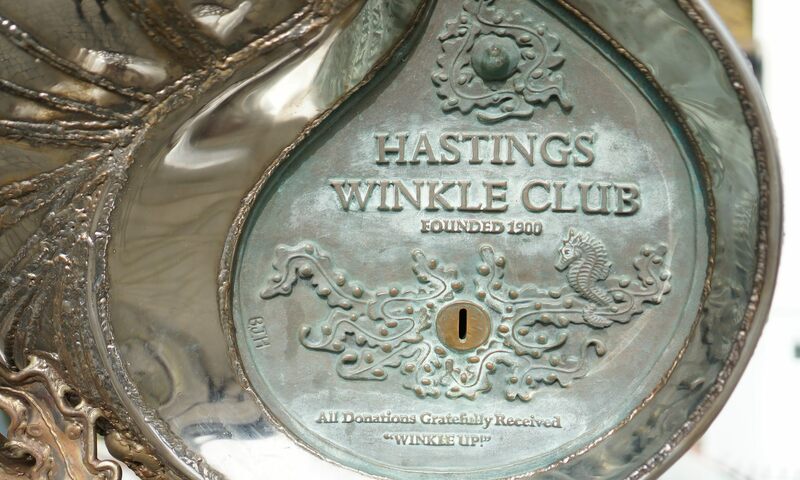 On Wednesday evening, as part of Old Town Week, the Hastings Winkle Club held its Annual Charity Putting Competition. An enthusiastic gang of Winkle Club members, friends, family and supporters gathered at the Adventure Golf Courses on the seafront. The high standard of play even made for an exciting ‘Play-Off’ in the Adult section. After a tense finish, Melissa Howe and Lily Springall were the victorious Juniors and Half-Marathon Man, Eric Hardwick won both the Adults and the Dave Morley memorial trophies. 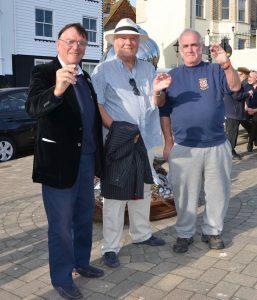 Winkle Club Vice Chairman, Richard Stevens said ‘We are very grateful to John Scollay and Stuart Homewood for organising the Competition and for the generosity of the Hastings Adventure Golf management.’ The evening raised around £500 for Winkle Club local good causes. 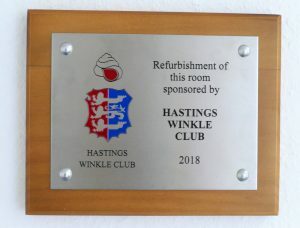 Traditionally an all-male Club, The Hastings Winkle Club has taken the rare decision to invest current Hastings Mayor, Councillor Judy Rogers, as an Honorary Member. The ‘induction ceremony’ was held last Saturday ( 30th. ) on board ‘The Enterprise’ fishing lugger in the Fishermen’s Museum in Rock-a Nore Road, Old Town. Honorary Membership of the famous 117 year old Winkle Club is only given in exceptional circumstances and Judy Rogers joins a select band of women, including the late Queen Elizabeth, the Queen Mother, to be offered the honour. 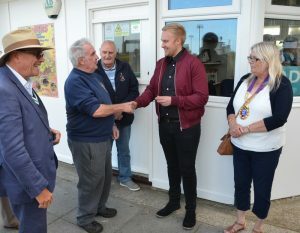 The ceremony itself was conducted by Richard Stevens and The Mayor received her winkle and membership card from Winkle Club Chairman, Richard Read. Ian Porter BEM was also part of the induction team. Several members of Judy Rogers’ family attended the ceremony as did members of the Winkle Club itself. Officers and Committee members arranged a special luncheon last Wednesday 24th. September to celebrate the 90th Birthday of their President, Sir Kenneth Warren. Sir ‘Ken’, a former member of parliament for Hastings has always maintained strong links with the town and the Winkle Club in particular. Michael Foster, High Sheriff of East Sussex was also present and congratulatory greetings were sent by Amber Rudd M.P. and Admiral of the Fleet the Lord Boyce (Lord Warden of the Cinque Ports). Pictured are Sir Ken Warren surrounded by Winkle Club members toasting their President’s great achievement. At the start of the Winkle Club’s Annual Putting Competition during Old Town Week, Cllr. James Bacon (new Old Town Councillor) was made a member of our historic Club in the presence of the Mayor, Cllr. Judy Rogers. The competition itself raised £350 which included a £100 donation from the Adventure Golf Management. We are most grateful to them and all monies raised will go to LOCAL good causes. Her Majesty’s Lord Lieutenant of East Sussex is Winkled Up! 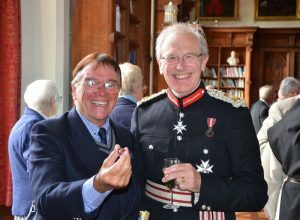 Peter Field, The Queen’s Lord Lieutenant of East Sussex was successfully ‘Winkled Up’ at a reception in Battle given by The High Sheriff of East Sussex, Michael Foster DL. Both Peter and Michael are members of our famous Club. Hundreds of dignitaries and friends of Michael Foster were in attendance at the reception in Battle Abbey when Vice Chairman, Richard Stevens, took his opportunity to pounce. David Sooner, Charles Ball, Mike Raxworthy and Carl Farrow. 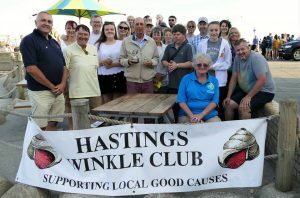 The Hastings Winkle Club held its AGM in early April as usual and were pleased to discover that we have managed to raise more money for LOCAL good causes than has been the case for many a long year. More than forty clubs and other organisations were chosen for donations and we have been able to ring-fence a useful sum for distribution during the forthcoming financial year. All good news. We elected our Officers and Committee members for the ensuing year though they do look remarkably similar to last year’s committee. Like many voluntary organisations we could do with some new and younger blood. We held our Spring Social in May and thanks are due to the fabulous Band: ‘Loose Ends’ who are fronted by our Honorary Secretary. All the Raffle Prizes were donated by members and the evening raised over £1,000. We also continue to give ‘Talks’ to various organisations about the fascinating history of our 116 year old Winkle Club. These seem to be well received and usually attract a donation for our charitable funds. There was also some very sad news in June when we learned of the passing of Lady Fleur Boyce, the wife of our Patron, Admiral of the Fleet, the Lord Boyce. Fleur had always provided great support to the Lord Warden and was a good friend to the Hastings Winkle Club. We were represented at her funeral and she will be sorely missed. After an immense amount of planning, we coordinated Hastings first Jazz Festival on June 4th / 5th. Although Saturday evening wasn’t to everyone’s taste, Sunday afternoon was superb. The sun shone and the music dazzled the enthusiastic audience on the Stade Open Space. 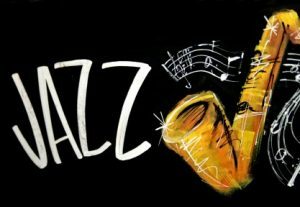 Jazzfest was a free event and only possible due to the hard work of our Fundraising Committee and our very generous sponsors. Thank you all. Many of the local Pubs supported the Festival with their own Bands which added to the success story. We do need more volunteers though if Jazzfest is to return next year. 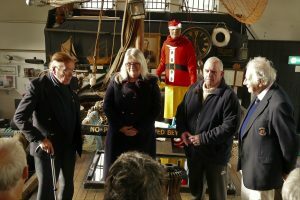 We attended the Blessing of the Sea at the Lifeboat Station and are pleased to see that the wartime Lifeboat, the Cyril & Lillian Bishop is being brought back to Hastings by Deeday White and Friends. 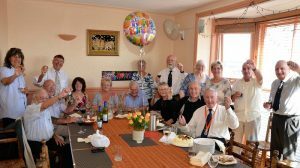 As Summer struggles to emerge, The Winkle Club looks forward to visiting our friends at the ‘Churchill Hotel’ in Marble Arch, the Lord Warden’s Reception at Walmer Castle and then Planning for Pirate Day and Old Town Week. We have a Putting Competition at the Adventure Golf Courses on August 3rd. from 6pm and our Winkle Tossing Competition on Winkle Island on Monday August 1st. from 2pm until 4pm. Please come and support us. If you would like to book a ‘Talk’ or volunteer to help us at any forthcoming events please give Ian Porter a ring on 07974 081582 . Let’s hope for a summer that is kind to us all for that will enable Clubs like ours to raise even more much needed resources for our Hastings Community. Wow! What a Winkle Jazzed-Up Weekend That Was!! 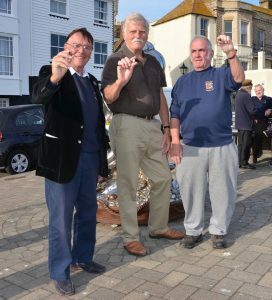 The Hastings Winkle Club is coordinating a special Christmas Event under the title of ‘Christmas Time To Remember.’ The idea is to commemorate and recall those who served in the Lifeboat Service (RNLI) locally or loved-ones who were Fishermen, Coastguards or Winkle Club members. The event will take place on Saturday December 19th at 6.30 pm and will begin with a lantern lit procession from the Priscilla MacBean site in Old London Road down All Saints Street to Winkle Island. The procession will be lead by a lone piper and representatives of the organisations concerned will follow on. 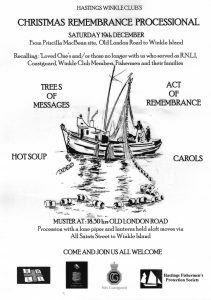 There will be an Act of Remembrance, Carol Singing and hot soup will be available on Winkle Island. 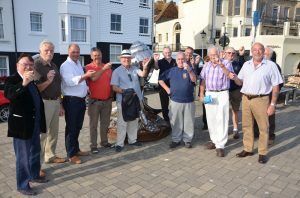 Vice Chairman of Hastings Winkle Club, Richard Stevens said ‘In order to collate the details of those to be remembered, we will be placing a number of boxes at strategic locations in the Old Town. Cards will be available to complete with the names of those who served and a space will be provided for an individual message to recall the loved-one and/or family member to be recalled in this way. Eventually all the cards will be tied on to Trees of Messages which will be placed on Winkle Island.’ he said.